Sat down tonight and decided on painting something different. Have had enough of WW2. 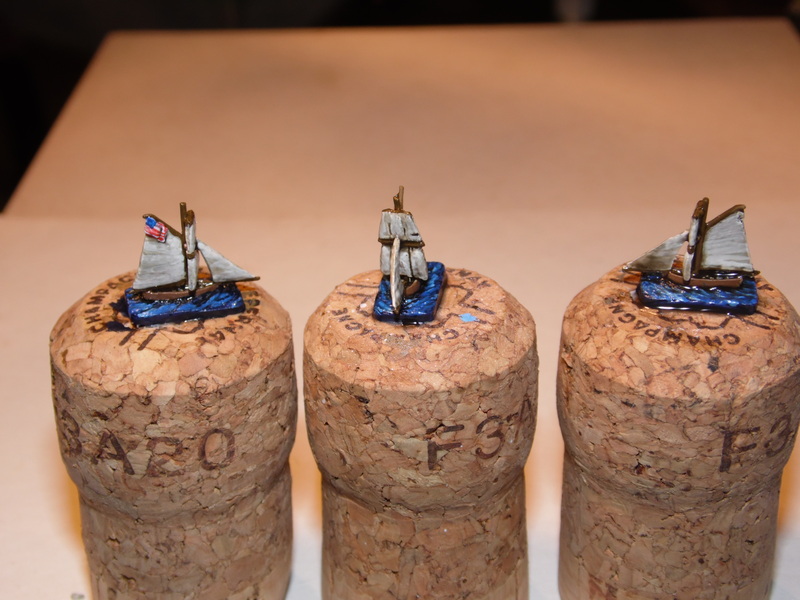 A few nights ago while looking for the British 2Lbr guns I came across a box of Figurehead 1/2400 Napoleonic Naval. I had seen these on a web site and thought they may be fun to have. I have a number of 1200 scale ships but wanted to find a better ground scale and fight larger actions with smaller rated ships. I think I was interested in the War of 1812 and the Great Lakes era at the time of purchase. Probably like most wargamers, I bought them and put them on the “to do” shelf. On opening them up I forgot how small they were. I decided to have a go at some of the smallest I have, FN16 Cutters, if I could not make these look good then I would lose interest and they would be back on the auction site for sale. In the pack were 3 models, so quickly I stuck them each on a cork to help holding them while painting, primed and within the last hour I have painted and varnished them. I have to admit I am quite please with the end result and will move on to the rest of them some time soon. Not sure yet as to what set of rules I will be using yet, but open to any suggestions. I would like to do games with 5-8 ships max usually commanded by one player, minimal book keeping and relatively fast play.